The past comes flooding back – scholars in the house of learning of our Lord. We moved from the Chapter House to the House of Learning in a regular, orderly fashion. 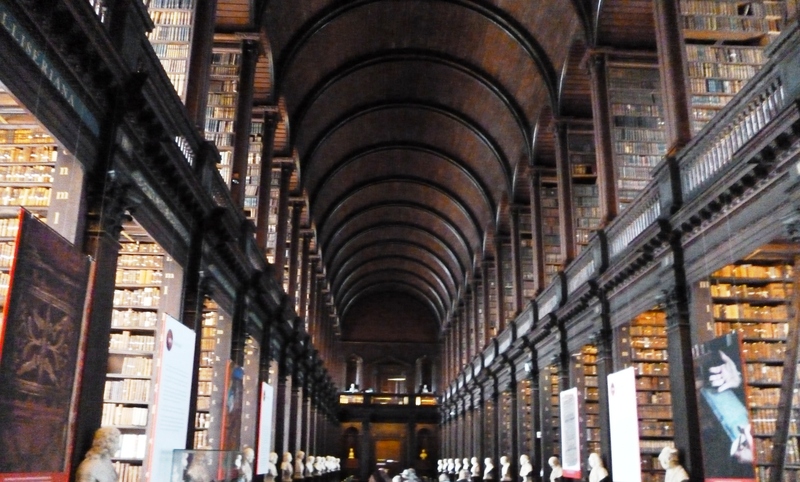 Visiting Trinity College’s old Library is to step back into a place of solitude and peace. Amidst the old books and archives, careful preservation and book binding has taken place over centuries With dedication and discipline the scholars of the past moved from prayer to study; from study to prayer. An air of communion surrounds us. Some tourists hurry by; others pause, and sit and reflect and enter into stillness. This Hall of Learning is connected, as are tens of thousands of other Halls of Learning worldwide, to the Temple of Wisdom upon Mercury. Under the general guardianship of the 2nd Ray Masters of Love and Wisdom, students come together, to soak up the wisdom; to receive tuition; to sit at the feet of the Masters. The Heartlight of Lord Kuthumi, who incarnated in the past as St Patrick, permeates this Hall of Learning, flowing throughout Trinity College and Dublin. Places of learning such as this inspire feelings of reverence for many students of the Ancient Wisdom. Whether in Athens, Rhodes, Rome, Delphi, Alexandria – centres of learning are often overshadowed by Temples of Wisdom on the inner levels of earth. The earnest student has but to reach through the veil; to call for assistance, tuition, Light; and Light will be revealed – that is the Law. To knock gently at the door of the Temple of Learning is to find and follow the Path that will lead you, sooner or later to the Tempe of Wisdom and the light of your own soul. To revere the Wisdom Teachings is to open the heart to your soul light. When this Light pours into the chalice, the grail within your heart chakra, then learning becomes wisdom and in time wisdom is transmuted into the pure gold of love. So seek, seek, seek and you will be led from the outer portal to the Path that leads to the inner sanctum and beyond. Seek, seek, seek and you will find the Light within. Go within. Go into silence. Go within. Copyright © 2013 Soul Astrology & Spiritual Healing, All rights reserved.